GRP is not a mere rating. It is a tool to push for improvement. A way to leverage change. Thus the rating must reflect the current state of the industrial sector, and point to improvements. So it is that in each rating, the project reviews the entire sector -- it focusses on actual performance, and not merely environmental management strategies -- and learns about the stress points. The rating scale is then changed to reflect these priorities. The first rating of this sector used data collected between 1995 and 1997. This rating uses a five-year database, built between 1998 and 2002. In this time, the sector went through substantial changes. Nevertheless, a lot more needs to be done so that this sector, highly resource-intensive and polluting, turns truly green. In 1999, only one company had ISO 14001 certification and none had environmental departments. GRP also realised that pollution monitoring within the industry was very poor and data received from companies wasn't very reliable. To drive the sector to improve the system of corporate reporting in each company, GRP assigned this phase 35 per cent marks. By 2002, this situation changed for the better. When GRP started its second-rating, it found that most companies had environmental management systems in place; many even achieved ISO 14001 certification. The first rating's effects became visible. Since assigning higher weightages to corporate policy and management systems had worked, the time had come -- so felt the team preparing the methodology for the second rating -- to push for further improvements. 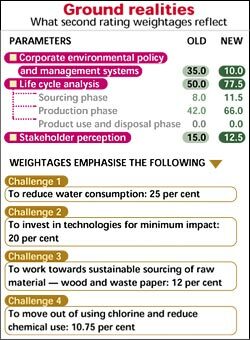 GRP therefore reduced the weightage assigned to the corporate environmental policy and management systems significantly -- to 10 per cent -- during the second rating. GRP also found that profiling each company by using different indicators helped management to push for improved measurement and monitoring systems. In the second rating period, companies disclosed more data, with greater accuracy and confidence. This prompted GRP to substantially increase the weightage assigned to raw material sourcing and production phase. The idea was also to hone industry's focus from policy and management systems to actual environment improvements. This rating, therefore, better reflects actual performance. It reflects reality. And suggests the way ahead. GRP also tightened the benchmarks for the pulp and paper industry during the second green rating. The benchmarks are now more specific to each mill, taking into consideration their raw material sourcing, production technology and product configuration. For instance, during the first rating the best practice for water consumption was considered as 50 tonnes per tonne of product produced for all types of chemical pulp mills. During the second rating, this changed; now, the global best practice was introduced for each type of chemical pulp mills. So, for example, the best practice for water consumption for wood-based kraft mills was reduced to 45 tonnes per tonne of product produced. Similarly the best practice for rayon grade pulp mills was reduced to 35 tonne per tonne of product produced. A tighter score-card makes for better and deserving performers. GRP is not meant to reward laggards or average performances. It is designed to make the best shine over the rest. Thus companies that have topped the rating this time should take credit that is completely due to them.